A layer of concrete, poured over a prepared surface of soil or gravel, that supports a house or other building structure. 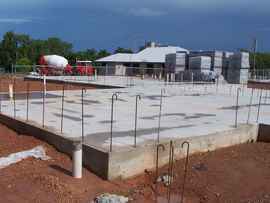 Slab foundations provide a stable level surface for building and support the weight of walls and other construction materials. A poured slab concrete foundation typically costs $3 to $5 per square foot.